Whether it's the live bands playing every mile along the race course, the cheering spectator-lined course, the 40,000 plus post-race party with free Saranac beverages, or it's the fireworks and the post-race flyover, there is just something very special and very unique about the Utica Boilermaker Road Race! This Race is not only the crown jewel of the running season for central New York, it's the greatest 15K in the nation. Each July, runners from all over the world including the most elite athletes on the planet come to Utica, NY to run in the Boilermaker. The Boilermaker has a transformative power on people's lives. Whether it's used as a source of motivation to get in shape or a summer centerpiece used to bring families together for an annual reunion, nobody finishing the Boilermaker is not either renewed, transformed, enriched, and extremely grateful for the awesome experience. Notre Dame Schools is honored to participate in this prestigious event, receiving reserved charity entries for our alway impressive runners and fundraisers. Notre Dame has secured 10 charity entries available for the 2015 Boilermaker, but those who have secured their own entry are also invited to sign up with the Notre Dame Running Team. Need an entry? E-mail Notre Dame Running Team Coordinator Kari Puleo at kpuleo@syrdiocese.org to request a bib. Please include whether you seasoned or new runner and/or your fundraising history for previous races/charity teams (if applicable). Team members using a Notre Dame charity bib will receive a free race entry and commit to a $500 fundraising minimum. Already have your entry? Runners who have secured their own race entry can still join the NOTRE DAME RUNNING Team by registering here. *Upon registering, you will be sent an Notre Dame Runner's Kit. This kit includes the training plans and Notre Dame information and fundraising material. Participants who receive guaranteed entry to the race through Notre Dame will agree to meet a fundraising minimum of $500. Each affliated runner who has secured their own bib and raises $150 will receive a Notre Dame shirt or singlet to sport on race day. Why RUN FOR NOTRE DAME? Notre Dame Schools is dedicated to providing a Catholic co-educational program in a value-centered, nurturing environment where academic excellence is fostered. Personal attention encourages all students to discover and develop their unique gifts and talents so they can reach their God-given potential. Notre Dame’s rich athletic tradition is noted for competitive squads, characterized by teamwork and good sportsmanship. Our student athletes at Notre Dame are encouraged to develop their full academic potential. Athletic participation is viewed as a complement to academic achievement, our hope is to tie together these two tenets to create well rounded individuals who value health and wellness into their adult lives. Notre Dame Schools takes pride in opening up the benefits of Catholic education to many families who are normally precluded from the advantages of a rigorous academic and faith-centered education. Not surprisingly the economy continues to be challenging for many of our families who continue to make education a top priority and do their best to make the financial commitment to assist their children in obtaining a Catholic education. The funds from this year's charity bib program, will support physical fitness by augmenting our facilities and upgrading our equipment to allow more students access to supervised conditioning and training. Any additional funds raised outside of these needs, will directly support scholarships for students. 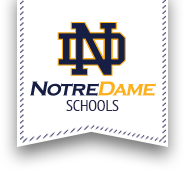 We assure you that Notre Dame Schools remain committed to preparing young men and women to be compassionate, responsible, faith-filled people capable of making a difference in the world today. Thank you in advance for your dedication to be a charity runner. Whether you are a runner, walker, donor or volunteer, your contribution makes you part of Notre Dame's RUNNING team. In the end, you will have made a difference in the lives of hundreds of students in their pursuit of learning and the responsibilities of faith and citizenship.